Making a purchase could not be easier. Just browse our on-line shop, and click on any items that you wish to buy to add them to your basket. After you have finished your selection, click on “Checkout” and submit the details that we need to be able to satisfy the order. We accept Visa, Mastercard and Switch. If preferred you may ring the shop directly, and place your order over the phone. Card details will be taken accordingly over the phone, once we have confirmed availability. VAT is included on our prices where it is applicable. A back order system will operate so that if your item is not in stock we will back order for you so that you are at the front of the queue when the item becomes available. You will always be emailed with the option to cancel your order if you would rather not wait or to have an alternative item which we may suggest that is in stock however, should you decide to cancel, any money taken from your card will be refunded immediately. We guarantee your satisfaction but cannot be held responsible for occassions where the courier fails to meet their delivery targets or damage items. If you receive a package that is damaged, has holes in it, torn, ripped or open then you must make a note of this on the form that you sign for your parcel as we will be unable to refund any loss without this. This explains what to do if you’ve received a damaged, defective or incorrect item from Hampshire Tackle. This returns policy does not affect your statutory rights. 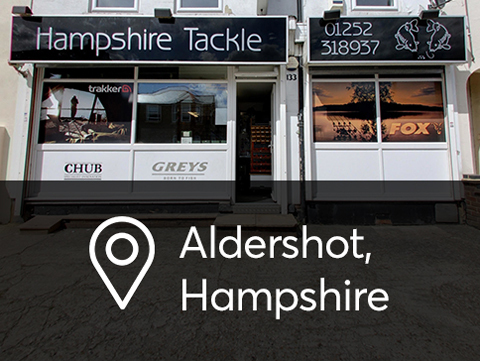 If you take delivery of an Hampshire Tackle package and the contents have been damaged in transit, you can return the item(s) to us within 30 days of receipt for exchange. Please follow the instructions below to return your item. As soon as you find out we’ve sent you an incorrect item, e-mail us and let us know. We’ll send you the correct item as soon as we can. Send the original item back to us (please follow the instructions below) and we’ll make sure you are not charged for it. If you don’t have the original invoice, include a note detailing the reason for return. This note must include your order number, which you will be able to find in the email that was sent to you when you placed your order online. We do not disclose buyers’ information to third parties. Cookies are used on this shopping site to keep track of the contents of your shopping cart once you have selected an item. The Supplier or its Content suppliers may make improvements or changes to the Website, the content, or to any of the goods, at any time and without advance notice. The Buyer is advised that content may include technical inaccuracies or typographical errors. The Supplier gives no warranty and makes no representation, express or implied, as to: the adequacy or appropriateness of the Goods for your purpose, the accuracy of any information given on the Website, any implied warranty or condition as to merchantability or fitness of the Goods for a particular purpose except where the Buyer is a consumer (as defined in the Unfair Contract Terms Act 1977 section 12) when the Supplier’s liability shall be restricted to the full extent permitted by law, compatibility of the Website with your equipment software or telecommunications connection, compliance with any law, non-infringement of any right. The Website may contain links to other Internet web sites. The Supplier has neither power nor control over any such web site. The Buyer acknowledges and agrees that the Supplier shall not be liable in any way for the content of any such linked web site, nor for any loss or damage arising from the Buyer’s use of any such web site. The Supplier is not liable in any circumstances for special, indirect or consequential loss or any damages whatsoever resulting from loss of use, loss of data or loss of revenues or profits, whether in an action of contract, negligence or otherwise, arising out of or in connection with the Buyer’s use of the Website or the purchase of Goods.